Dr. Jake Cooper, his son Jay, and adventurer-journalist Meaghan Flaherty evade angry terrorists and cannibal tribes as they desperately search for Lila Cooper after her plane is hijacked in a remote corner of the Pacific. 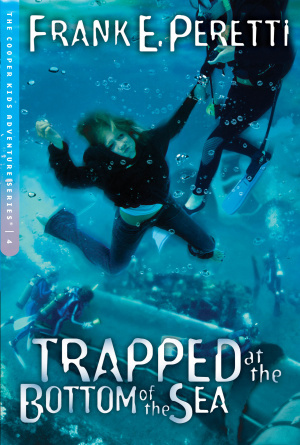 Trapped at the Bottom of the Sea by Frank E. Peretti was published by Intervarsity Press in July 2004 and is our 15192nd best seller. The ISBN for Trapped at the Bottom of the Sea is 9781581346213. Be the first to review Trapped at the Bottom of the Sea! Got a question? No problem! Just click here to ask us about Trapped at the Bottom of the Sea.